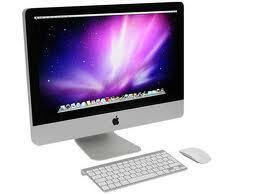 A month or so ago I fuelled my apple addition further with the purchase of a iMac. I have to say I’ve been delighted with the iMac so far and thought I’d take a few minutes to share some of the things I’ve discovered. As with all the other apple kit I’ve bought getting started with the iMac was a piece of cake, take it out the box, plug it in and you’re away. Well not quite but almost, you need to go through a set up routine but this really is very easy and straightforward. Next comes the task of moving years of ‘stuff’ from my PC over to the iMac. This again was a very simple task. I had a Seagate external hard drive, which I could just copy files onto from the PC. It didn’t matter that this was formatted NTFS as the iMac could read the files and simply copy them over. This also gave me the opportunity I needed to clean my content up along the way. There is an option in iTunes that consolidates all of your iTunes content into one directory structure and then you just need to copy it over just as you would do for ordinary files. What’s more I feel it’s made iTunes housekeeping much better for me as I add more content on the iMac. I have over 100 movies converted to Mpeg format, which I use on my apple TV and on my iPad when travelling. On the advice of someone who has been a long time mac user I installed the conversion package called Handbrake. You wont find this on the app store, you’ll need to google for it. You’ll also need to install a new codec and I chose the one that comes as part of the VLC media player. I tried Handbrake once before on the PC but it didn’t work for me. However, on the iMac I’ve had a 100% success rate and I’ve already converted 20 or so movies. Next was Office software. I chose Microsoft Office for Mac on the basis that I use this all the time at work and my iMac being in my homeworking office it makes it easier to share documents etc. Again this was very east to install and setup. I can’t remember it being as easy on the PC, but then again I haven’t done it for years. Now the 27″ screen on the iMac might be having an effect on me here but I feel the user experience of Office on the Mac is much better than it is on the PC. Now I’m thinking I should have this thing backed up, so I check out Time Machine. It just gets better, this sounds good but I need a Time Capsule to get it going. Actually it would be nice, and I’ll probably buy one some day, but it’s not essential as Time Machine works with any hard drive. So I decide to reformat my Seagate external hard drive to Mac format, which only took a couple of minutes, and use this (it sits neatly under my iMac). Then it’s a simple job of turning on Time Machine, pointing it at the external drive and we’re up and running. My Kodak ‘all in one’ wireless printer was just as easy to connect and I’m printing in minutes. Along the way I also decide that I need a new wireless router and so after a bit of research I buy a dual band Cisco router. It’s great and instead of the 54Mbps I was used to on the PC, I instantly benefit from 300Mbps on the iMac. And finally I go down to the local apple store and come back with a Magic Trackpad. Words can’t describe how good this thing is. Who would have thought the day would come when you don’t need a mouse? Well this thing has rendered the mouse obsolete, its fantastic. So, If you’re thinking of switching to a Mac then my advice would be to go for it, its dead easy to convert and you’ll not be disappointed. Other than if you have to go back to using a PC for any reason. Previous postCustomer Service whose job is it anyway? Just do it Kev… How does that sound? Having been encouraged by your positivity I have just spoken to my wife. Apparently I’m aiming too high and may need to have to consign myself to a new MacBook! Roll on the lottery….